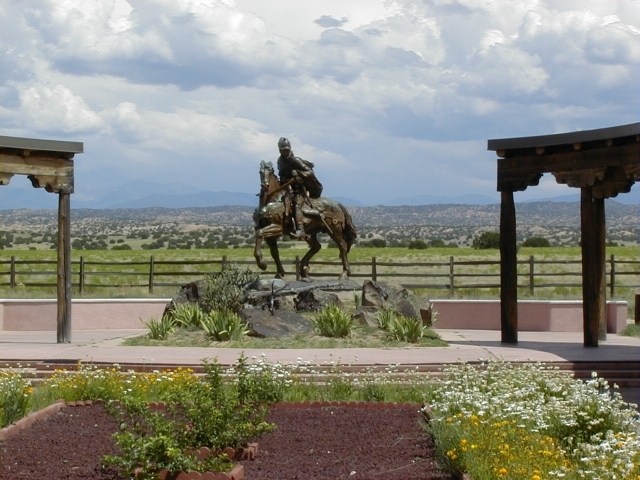 This imposing twelve-foot high statue of Juan de Oñate is located a few miles north of Española, New Mexico. In January of 1998, it was damaged by vandals. ESPAÑOLA, N.M. -- One moonless night in early January, just as Hispanic New Mexicans were starting to celebrate the 400th anniversary of the first Spanish settlement in the American West, an American Indian commando group stealthily approached a bronze statue here of the first conquistador, Don Juan de Oñate. With an electric saw, the group slowly severed his right foot -- boot, stirrup, star-shaped spur and all. "We took the liberty of removing Oñate's right foot on behalf of our brothers and sisters of Acoma Pueblo," read a statement sent by the group, which later sent to news outlets a snapshot of its hostage foot. "We see no glory in celebrating Oñate's fourth centennial, and we do not want our faces rubbed in it." The news quickly traveled from this lowland reservoir of Spanish culture 120 miles to the southwest to a mesa, where cheers echoed among the adobe brick houses of Acoma Pueblo. Since 1599, the Acoma had passed from generation to generation the tale of how Juan de Onate had punished the conquered Acoma by ordering his men to chop off the right feet of 24 captive warriors. "It was funny when it happened to the statue, but it wasn't funny when it happened to the real people," said Darrell Chino, an Acoma artisan. At the Oñate Monument and Visitors Center, Estevan Arrellano, the director, supervised the attachment of a new foot to the 12-foot-tall statue in late January. He groaned: "Give me a break -- it was 400 years ago. It's OK to hold a grudge, but for 400 years?" "When I think of what Oñate did to the Acoma Pueblo, I have a vision of Indian men lined up to have one foot cut off," Andres Lauriano, a Sandia tribal council member, wrote in The Albuquerque Journal. "I see the blood pouring from their legs as they crawled or hopped away. I see the bloody pile of feet left behind." But the foot-chopping incident should not overshadow Oñate's positive achievements, argued Marc Simmons, author of "The Last Conquistador: Juan de Oñate and the Settling of the Far Southwest" (University of Oklahoma Press, 1991). "In what is now the Western United States, he was the founder of the livestock industry, the mining industry, and he opened the first major road, the Camino Real," Mr. Simmons said of the 16th-century entrepreneur who was married to a granddaughter of Cortes. "He brought Christianity and Western culture." The picture at left shows the repaired statue as it appears today. The welding line can not be seen in this picture, but if a visitor looks closely the repair line is easily seen.